Each chapter includes a Bible passage to read and a verse to memorize, along with an explanation of any unfamiliar terms; the main lesson is followed by "Thinking it Through" Bible and reading comprehension exercises. Insight into the New Testament world is featured throughout with biographical and historical sketches. 178 indexed pages, softcover. Level C, Grade 9. 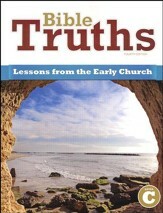 This resource is also known as Bob Jones Bible Truths Student Worktext Level C, Grade 9, 4th Edition. 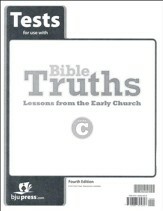 These tests accompany BJU Press' Bible Truths Grade 9, 4th Edition curriculum. They include only the tests; answers may be purchased separately in the Bible Truths Grades 9 Test Answer Key, 4th Edition. 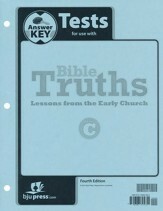 Questions include scripture memory, matching, short answer, chapter content, chronology, true/false and multiple choice. Tests are not reproducible; one test per unit is included. Glue binding for easy removal. 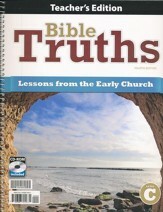 This resource is also known as Bob Jones Bible Truths, Grade 9, 4th Edition.